YEAR TWENTY ENDS, YEAR TWENTY-ONE BEGINS. Happy 20th anniversary, Superositites! Can you believe it? Holy wow, 20 years and 7,306 strips. That's nutso. If you feel like being a real weird person and celebrating this, you can go out and buy a cringe-inducingly stupid parody comic book called FARTNITE on March 6th. I had a hand in creating it, and there's even a 3-page 20th anniversary tribute to SUPEROSITY in the back. The backside of a comic book called FARTNITE is surely the most fitting place for a 20th anniversary celebration of this little comic strip. If your local comic shop doesn't carry it, you can order it online RIGHT HERE. 41 years and counting of yours truly! If you want to give me a birthday gift of a large sum of cash money every month, click here. WAS TOO SICK TO DRAW! NOW FEELING BETTER AND I'M BACK! Sorry for the missed strips (but thank you for noticing)! Been really sick since Saturday, but I'm mostly better now and I'm gonna try to do two strips a day until I'm caught up. YEAR NINETEEN ENDS, YEAR TWENTY BEGINS. Happy 19th anniversary, Superositites! Today's strip is #6,941... less than 60 strips to go until the big #7,000! In your country, how do you celebrate 7,000 SUPEROSITY comic strips? Let me know on Twitter (@chriscrosby)! YEAR EIGHTEEN ENDS, YEAR NINETEEN BEGINS. Happy 18th anniversary, Superositites! Today's strip is #6,576. Have you accidentally discovered the password to OUR universe yet? If so, E-Mail me and let me know! I could really use it. I SAY IT'S MY BIRTHDAY YET AGAIN! 39 years and counting of yours truly! Because it's 2016, why don't you put some of your money into my bank account via the wonders of Patreon? YEAR SEVENTEEN ENDS, YEAR EIGHTEEN BEGINS. Happy 17th anniversary, Superositites! Today's strip is #6,211. Hey, have you heard about my Patreon? I hope not, because it's very embarrassing! But if it helps me find that one generous multi-millionaire I just KNOW is reading and mildly enjoying my work, it'll all be worth it. Fingers crossed! I FORGOT TO WISH YOU A HAPPY NEW YEAR, SO INSTEAD I WILL ASK YOU FOR AN OBSCENE AMOUNT OF MONEY. I SAY IT'S MY BIRTHDAY AGAIN! 38 years and counting of yours truly! To those who care, thanks for the birthday wishes I'm already seeing on Facebook, a popular website designed specifically for posting birthday greetings to friends and associates. YEAR SIXTEEN ENDS, YEAR SEVENTEEN BEGINS. Happy 16th anniversary, Superositites! Time sure does fly, don't it? Seems like just yesterday I was drawing the first SUPEROSITY strip and thinking "boy, once I'm in the 17th year of this daily comic I'll have had so much practice drawing that the artwork will be SPECTACULAR!" And boy, was I sure right, as you can see from the beautiful linework displayed in today's masterwork. Today's strip, incidentally, is #5,845. Almost to #6,000! Won't that be... a lot of comic strips? I certainly think so. 37 years and counting of yours truly! Thanks for all the nice birthday wishes I'm seeing on my Facebook page, as is the custom of this era in time. YEAR FIFTEEN ENDS, YEAR SIXTEEN BEGINS. Happy 15th anniversary, Superositites! Today's strip is #5,480. I hope all of your SUPEROSITY 15th anniversary celebrations go spectacularly. Party responsibly, please. YEAR FOURTEEN ENDS, YEAR FIFTEEN BEGINS. Happy 14th anniversary, Superositites! Today's strip is #5,115. Can you believe I didn't make a big deal of strip #5,000? That's probably because I had to be informed I had hit #5,000 by little brother Bobby a week after it happened! Too bad, you all could've held SUPEROSITY #5,000 parties all over the world in honor of it. 35 years and counting of yours truly! I am sorry I only update this section on anniversaries and birthdays now. If you want it updated more often, tell me on Twitter! Or don't and I will attempt to guess your feelings on this subject. YEAR THIRTEEN ENDS, YEAR FOURTEEN BEGINS. 34 years and counting. Thank you for all of your kind birthday wishes on Facebook and Twitter. On a not-at-all-happy note, yesterday I was forced to say goodbye to my best doggie pal, Dodger Blue. She lived to the ripe old age of 15 (I think that's something approaching George Burns age in dog years), and was by my side as I drew every single SUPEROSITY strip until today's. She was usually barking at me to go to sleep, as I draw this thing way too late at night. I miss her already. For reasons that appear to make some amount of sense, the wonderful SUPEROSITY fan-blog formerly known as SUPEROSITY MAKES ME GAY has title-changed to SUPEROSITY MAKES ME GIDDY. The new URL is superositymakesmegiddy.blogspot.com. Update your internet book-mark hot-links accordingly! YEAR TWELVE ENDS, YEAR THIRTEEN BEGINS. BARK IF YOU LIKE ADVENTURES IN THE WHITE HOUSE! In case you haven't been following everything I do religiously, please check out BARKER and THE FIRST DAUGHTER, two new-ish comics I'm involved in the creation of! 33 years and counting of yours truly! Instead of buying me a present like you normally do, why don't you buy something nice for yourself? Oh, and follow me on Twitter for no reason. YEAR ELEVEN ENDS, YEAR TWELVE BEGINS. CELEBRATE THE 10TH ANNIVERSARY OF STUPID CRAP! Almost exactly one decade ago, young Chris Crosby and his teenage brother Bobby slaved away producing our very first Flash short, a little gem of a mash-up parody called PARKEMON. It was released around the time that POKEMON: THE FIRST MOVIE was taking theaters by storm and coincidentally a week or so before SOUTH PARK did their "Chinpokomon" episode. It somehow was viewed by millions of millions of people, and I still get E-Mails from people asking when the second one is coming out (probably never). I PRODUCED A DORITOS COMMERCIAL! WATCH IT AND I'LL BE YOUR BFF! The haunting siren call of Doritos' CRASH THE SUPERBOWL 2010 contest spurred me to produce an entry, as I have always dreamed of producing a commercial to air on the Super Bowl in the hopes that it will one day be turned into an amazing movie like SPACE JAM. Please make my dream a disturbingly real reality by watching the commercial (hit the SKIP INTRO button in the bottom right of the screen to go straight to our video), and if you like it, please leave a comment saying so! Thank you kindly, BFFs. 32 years and counting of yours truly! In just ten short years, I'll be 42, thus gaining access to the answer to life, the universe, and everything. That'll be cool. But please, don't send me a birthday present, just follow me on Twitter. It's so hot right now, much like Hitler's appearances on THE HILLS. I don't think I've mentioned here yet that I'm on Twitter. I am! Follow me and perhaps all of your dreams will come true! It will be unrelated to following me on Twitter, but still. FOLLOW! The super Superositites who populate the fantastic fan blog SUPEROSITY MAKES ME GAY decided recently that Wikipedia.com alone wasn't big enough to hold the vastness that is SUPEROSITY, and so, WIKISUPEROSITY.COM was born. Yes, there is now an entire Wiki-powered site devoted to this little comic strip. And it's already off to a great start, it looks like! If you so desire, as a card-carrying Superositite you are invited to join in the fun and create and/or edit some articles over at the SUPEROSITY WIKI. There's more than ten years and nearly 4,000 strips of crazy nonsense to catalog, so the Wiki can surely use your assistance. WIKI! YEAR TEN ENDS, YEAR ELEVEN BEGINS. Happy 10th anniversary, Superositites! 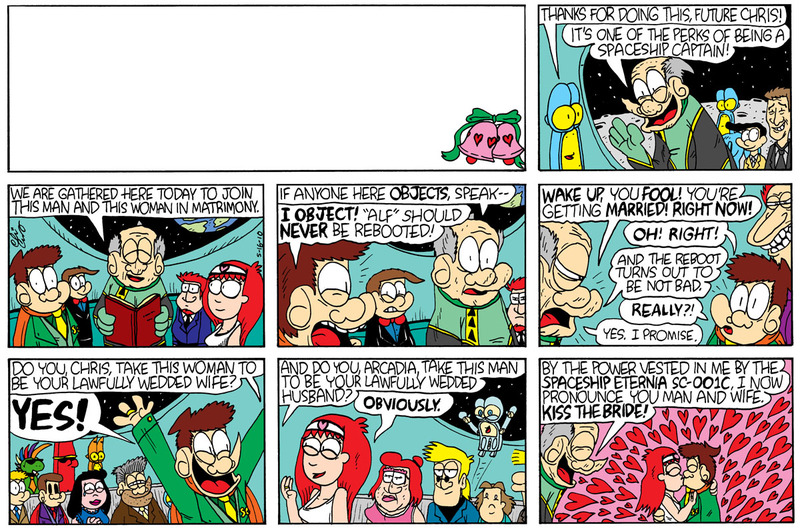 Wow, 10 years and 3,654 strips. Maybe this is the year that SUPEROSITY finally catches on? Let's hope so! Tell a friend. Wait, no, tell 10,000 friends. In honor of the 10th anniversary. Thank you in advance. I love you. SUPEROSITY turns ten in two months' time. Wooooooo. SUPEROSITY and all related characters are TM and (C) 2019 Chris Crosby. All rights reserved. Any of the STAR TREKs! They're jolly good fun.